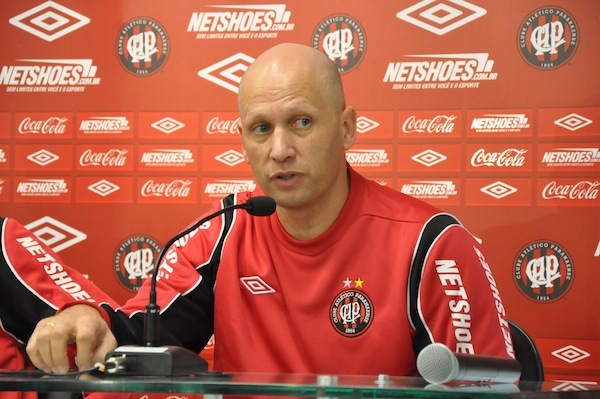 Admittedly we jumped the gun in regard to the expected arrival of Thiago Scuro to replace César Sampaio: turns out the chosen one is Omar Feitosa, currently the coordinator of physical preparation of athletes at Atlético Paranaense football club, a position he held at Palmeiras between 2007 and 2010. The 45-year-old has worked at many a Brazilian club and can also point to a couple of international experiences in his CV: Shenzen Jianlibao from China and the Lebanese national team. Feitosa was invited by Paulo Nobre himself, who openly admits to liking Feitosa’s rather “hard” and serious approach. The new administrator will not, unlike Sampaio, participate in negotiating players, but rather be the link between players and directors. As he’s never exercised this specific function before, it will be Football CEO José Carlos Brunoro’s task to mould Feitosa, who reportedly has accepted the invitation and is expected to start at Palmeiras on 2 February. Last Wednesday night Palmeiras played their second game in the São Paulo championship, beating Oeste 1-3. Positive aspects include Valdivia’s good performance when coming on in the second half, Luan’s goal (Luan has declared he’s “fed up” with the criticism he’s receiving from supporters and has expressed his wish for a transfer: early next week we should learn whether Nobre/Brunoro/Kleina have decided to stick with Luan or if it’s time to part ways. Brunoro has confirmed that several teams are interested in the player. Either way, Luan scoring is good if he stays and good for boosting his value if he de facto is negotiated) and yet another solid performance by Prass. On the negative side, best-so-far midfielder Souza hurt his left knee and should be out for 2-4 weeks. Watch the highlights below. Tomorrow Sunday Palmeiras face Penapolense in the third round of the Paulista. The game take place at the Pacaembu stadium, 17h local time. Penapolense beat Ituano 3-0 in the first round, only to lose to Mogi Mirim by the same score in the second. It’s anybody’s guess, but Palmeiras should win and win comfortably. You can’t underestimate them, due the another games that they played before. “The game is played”. Wellington, your comments continue to intrigue me… Is this a reference to not underestimating Penapolense? I’m not. But if we can’t consider Palmeiras do be the favourite, Palmeiras’ in a much worse state than I could imagine. Its not that we can’t be the favourite ones, is just that when we put so much hope in something and the result doesn’t come it can be a disaster, for example with Corinthians x Tolima… and the palmeiras is already badly hurt. That’s true. We’re badly hurt. But change is coming, and coming fast. I can feel it. Can you? : ) Cheers! I guess I deserved it… What a slap in the face that was. Thanks for the reality check, Wellington. I will not say that I told you, but lets face the true. This year we’re still a big team but with a lot of problems, and we need to be humble, Its the only way to back to the top, I still believe in this team, but is just because I don’t create big expectations. I really hope so. But we have to face the true, this year isn’t for make big deals, but just for fix the problems. Slowly is the best way to back to rise again.